CDR FoodLab for chemical analysis in fats and oils on Dulcelandia. Home > News & Topics > News > CDR FoodLab® for chemical analysis in fats and oils on the December 2016 Issue of the Mexican magazine Dulcelandia. “Con estos equipos, en un minuto se puede obtener un resultado de los ácidos grasos libres, que es lo que se trata de controlar en los aceites para freír. También se puede hacer peróxido, jabones y anisidina”, said Patricia. 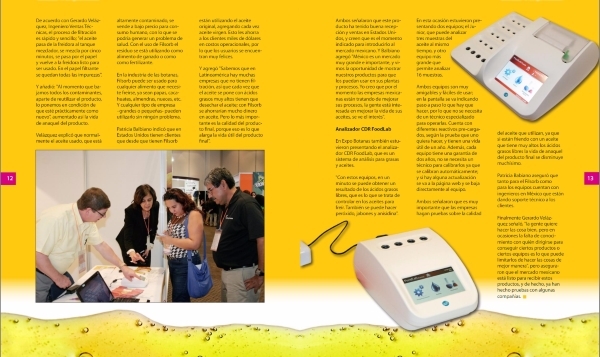 CDR FoodLab® for chemical analysis in fats and oils on the December 2016 Issue of the Mexican magazine Dulcelandia. was last modified: June 5th, 2017 by CDR s.r.l.